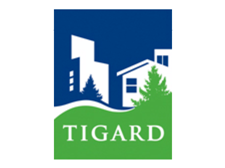 With a diverse economy, strong schools and outstanding parks, Tigard is one of the most livable cities in Oregon. Since its incorporation in 1961, the city has grown to become a desirable and affordable community in the Portland metro area. Residents enjoy access to more than 16 miles of paved trails and nearly 550 acres of parks and open spaces. Residents have a range of public transportation choices to nearby Portland, Beaverton and Hillsboro. Other amenities include shopping at Bridgeport Village and Washington Square Mall as well as easy access to multiple full-service medical facilities. The Cascade Mountains, Oregon’s famed beaches and the Columbia Gorge are all accessible as day trips. Tigard’s historic and walkable downtown offers unique shopping, eating and drinking establishments, transit connections and access to bike and pedestrian trails. The area is undergoing a transformation into a local destination. The city, in partnership with downtown and business stakeholders, has revitalized its downtown with public art, LED street lights and multiple trail connections, creating a walkable destination for residents and visitors alike.